The food pyramid is a good guide to healthy eating throughout a lifetime, but sometimes it can feel a little difficult to get started. These hints and tips will help you move towards a healthier diet without it seeming like a strain. Take one meal a day and convert it to food pyramid standards. Then, when eating that one meal to food pyramid guidelines has become second nature, move on to another meal. The easiest meal for most of us to change is breakfast. 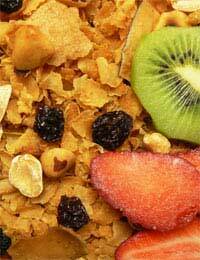 Begin by choosing a wholegrain breakfast cereal without added sugar. Serve it with low fat milk. Add a low fat yoghurt with a good helping of fresh fruit and finish with a glass of fruit juice and a piece of fruit that’s easy to eat like a banana or apple. You have instantly turned one meal a day into food pyramid perfection. Why bother with whole grains? Because consumption of such grains gives a reduced risk of some chronic diseases. Remember that the colour of a food doesn’t necessarily mean it’s a whole grain. Breads and cereals can be brown because they are high in molasses or other added ingredients that are not necessarily healthy. Check the ingredients list to confirm if whole grain is present. Chose whole-wheat bread instead of white bread or brown rice instead of polished rice. Removing the refined product is as important as adding the whole grain one, so don’t just add more whole grains and keep your old bad habits too. Try whole-wheat macaroni in macaroni and cheese to give a nutty flavour. Why eat vegetables? They help you lose weight because they are lower in calories that most other foods, and they can help protect against cancer, type 2 diabetes and the stroke and other forms of heart disease. One way to really add to your vegetable intake is to use colours. In any day, make sure you eat at least one green, one red and one other coloured vegetable. Your third colour could be orange (carrots or pumpkin), black (aubergine or salsify), white (potato, mooli, parsnip), purple (purple-sprouting broccoli, radicchio, beetroot) and so on. This gives you a real variety of foods in your diet and makes choosing vegetables into an adventure. Try to either buy fresh vegetables in season, as they will be cheaper and have the highest level of nutrients, or to grow some of your own vegetables for peak flavour: baby carrots, fresh salad leaves and home grown herbs can all add to your diet at little cost to you. Aim to eat one raw vegetable a day - carrot sticks or sweet red pepper strips can be added to a lunch box or treat yourself to an avocado to eat while you watch TV in the evening. It’s easy to add fruit to your breakfast by adding bananas, sliced peaches or strawberries to your cereal, or popping some blueberries, raspberries or mandarin slices to a yoghurt. But don’t stop there – you can boost your lunch by taking a small orange or bunch of grapes to eat. They fit easily into a bag or briefcase. Try fitting a fruit portion into your savoury dish at dinner. You can add a grated apple to coleslaw, some grapes to a salad, a handful of prunes to a beef casserole or a sliced red apple to top pork chops.